Acupuncture is a tool used by physiotherapists to treat acute and chronic painful conditions of the musculoskeletal system. In western medical terms, acupuncture stimulates the nervous systems and promotes release of your body’s natural chemicals (e.g. endorphins, anti-inflammatory substances) to relieve pain, stimulate healing and promote physical and emotional health. 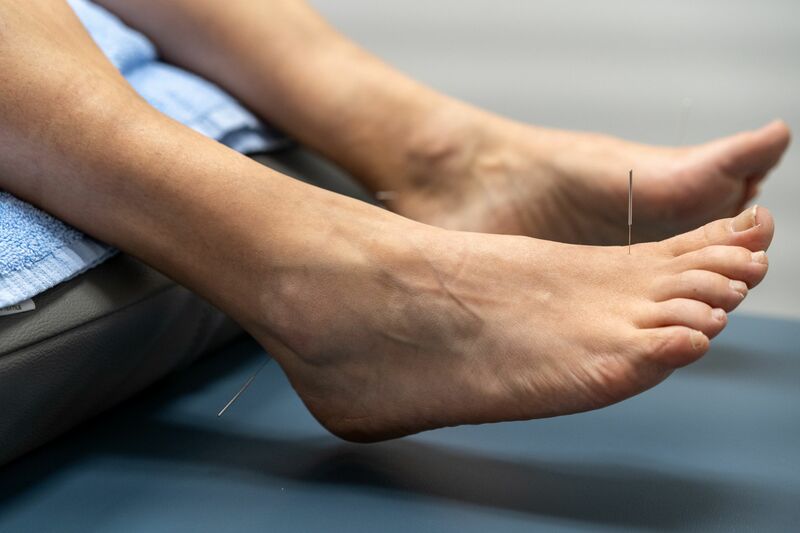 The physiotherapists at Kamloops Physiotherapy and Sports Injury Centre that offer acupuncture have taken extensive post graduate training and examinations to ensure they meet the standards to be safe and effective. Check out the individual physiotherapist’s bios on our Team page to find a physiotherapist who can offer you acupuncture. Acupuncture is used by physiotherapists by inserting thin, solid needles into very specific points of the body to treat muscle problems, chronic pain, headaches, jaw pain and numerous other musculoskeletal conditions. Other practitioners such as Traditional Chinese Medicine (TCM) acupuncturists and medical doctors may use acupuncture to treat other conditions such as problems with breathing, heart, digestion or allergies. It is also used to treat addictions and for stopping smoking. As physiotherapists it is only within our scope of practice to treat pain and movement problems associated with your muscles, joints and nerves. Physiotherapists utilizing acupuncture are using it as a tool within their physiotherapy treatment plan and are not functioning as an acupuncturist. When a physiotherapist utilizes acupuncture it is still considered physiotherapy and is thus covered under extended medical plans as a physiotherapy visit. Acupuncture provided by a physiotherapist can not be claimed under extended medical insurance as a visit to an acupuncturist. Acupuncture is safe when performed appropriately in appropriate patients. Certain medications and medical conditions may make acupuncture less appropriate so your full medical history will need to be evaluated to determine if acupuncture can be used with you. If you are pregnant and interested in acupuncture treatment you should inform your therapist and discuss whether it’s the best treatment option for you.